When was pneumatic tube transport invented? The history of pneumatic tube transport leads back to the 19th century. 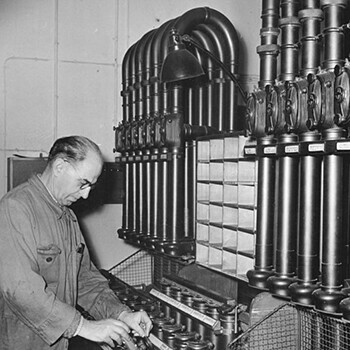 From this era stem the first reports on pneumatic tube systems. When exactly pneumatic tube transport was invented, is difficult to say, because different inventors contributed elements toward the technology. The earliest pneumatic tube systems reported were mainly used as postal service system. It connected post offices, stock exchanges, banks and ministries. Respectively, letters, telegrams, parcels, documents and cash were sent through the tubes. The first urban pneumatic post run in London from 1853. It was only 200 meters long. From the second half of the 19th century pneumatic mail networks spread further in big cities worldwide. The networks got bigger and bigger until some had a length of up to 100 km. 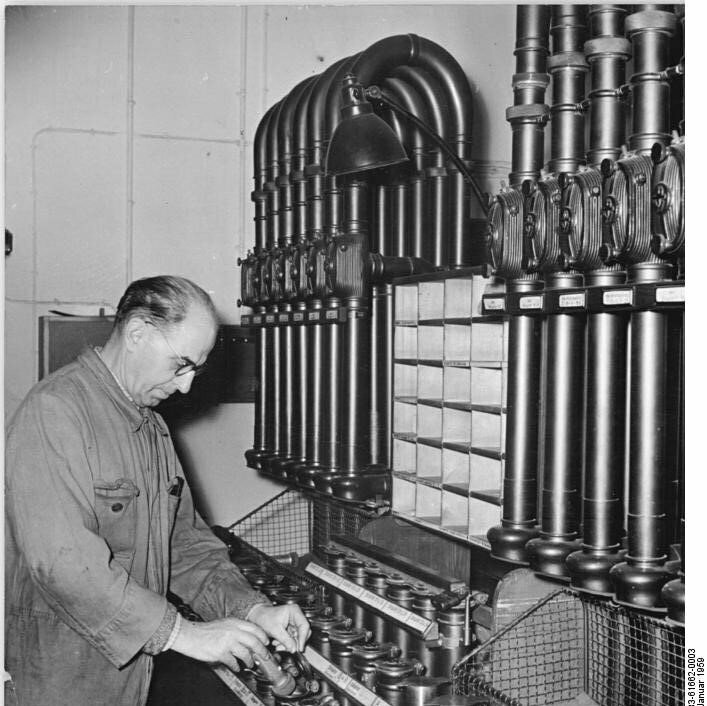 Remarkable was the pneumatic tube system in Hamburg. The inner diameter of its tubes was 45 cm, which was enormous and is large by today’s standards. Up to 2000 letters were fitted into one carrier which could be transpartoed through the tubes with up to 13 meters/second. This made it possible to send around 90.000 mailings per day. It was so popular, that in Germany one could even buy special stationery for it. Prague’s pneumatic tube system was in use for the longest time. It has only fallen out of use after heavy rainfall flooded it in 2002. It has since be defunct. Who invented the pneumatic tube system? The Scottish engineer William Murdoch was the inventor of pneumatic tube transport for postage. Later, he developed systems for the company London Pneumatic Dispatch. The Danish engineer George Medhurst is mentioned as inventor, as well, because it is said that he began to use differences in pressure for transport from 1810. The first patent was registered by Josiah Latimer Clark in 1854 for the transport of mailings and parcels via pneumatic tubes. He also installed the above mentioned first urban pneumatic post in London. None of the previous mentioned pneumatic post networks are still in use. The “Hamburger Großrohrpost”, for example, was affected by too many faults. Today’s pneumatic tube transport systems still built on these early ideas, but the technical facilities have been enhanced greatly in the 21th century. The error-proneness of the past technologies had been erased and the systems are used for very different purposes nowadays. For more information on pneumatic transport use today see: http://rohrpost.de/applications/?lang=en.